Apple Green von Rival de Loop Young aus der Cupcake LE. There have been a lot of new nail polishes in the last weeks and I would love to show them all to you. So right now I'll make a start with Apple Green by Rival de Loop Young from the new Cupcake LE. Apple Green ist ein toller grüner Lack, mit verschieden großem Glitter in hellgrün, dunkelgrün und gelb. Der Lack ist sehr sheer, deshalb habe ich eine Schicht Apple Green über einer Schicht Aloha Dreams von P2 lackiert. 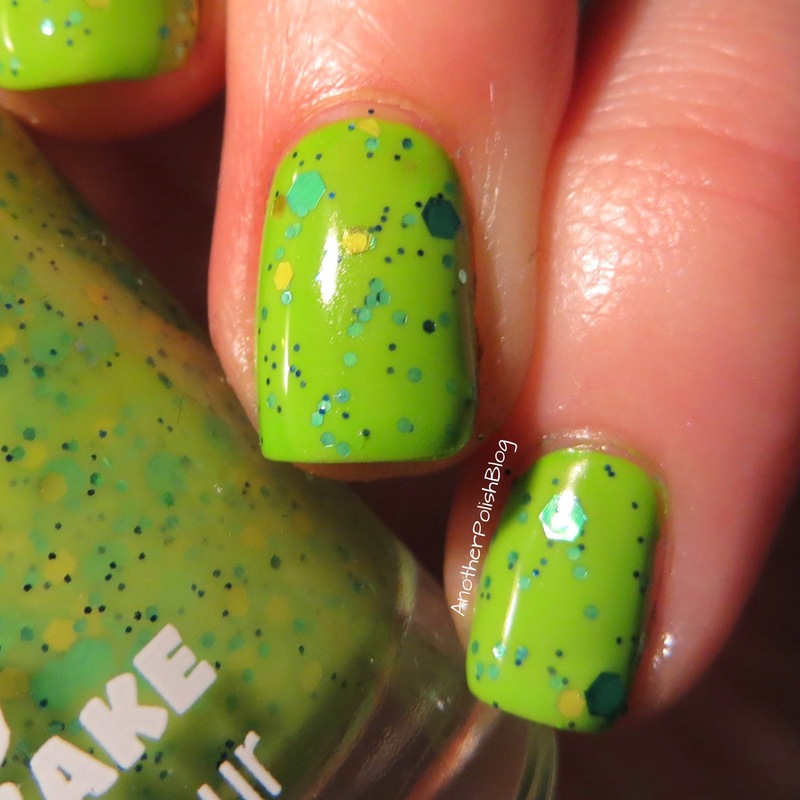 Apple Green is a lovely green polish with lots of green and yellow glitter of different sizes. It is extremely sheer, so I applied one coat of Apple Green on top of one coat of Aloha Dreams by P2. I really love this polish and I think it would look good as a base for a design as well! And this vibrant colour is just amazing for spring, don't you think? Und hier habe ich noch ein Close-Up für euch. Ein toller Lack, findet ihr nicht? And finally, here's a close-up for you. Such a lovely polish, isn't it? Wie gefällt euch der Lack? Habt ihr noch einen anderen der Cupcake-Lacke von Rival de Loop young? Vergesst nicht auch bei meinem Gewinnspiel mitzumachen! Have you tried another of these Cupcake-polishes by Rival de Loop young as well?